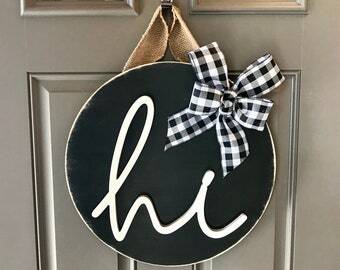 >>SIZE: 18” wood round door hanger; 1/2” thick. 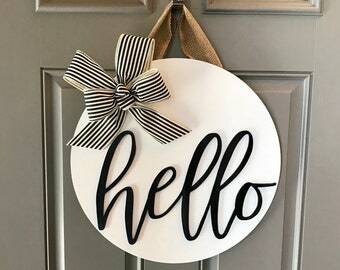 Our door decor is lightweight but has a nice thickness that will ensure it does not bow or warp. 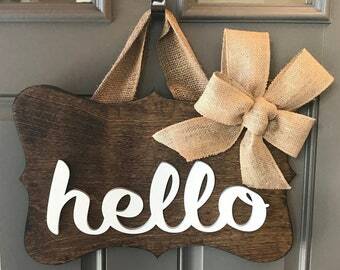 The burlap hanger is about 6” long. 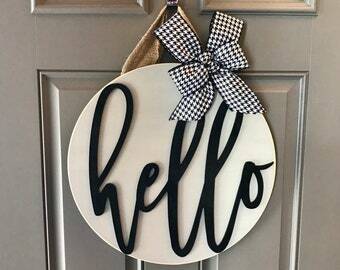 If you are looking for smaller or larger door decor, send us a message! 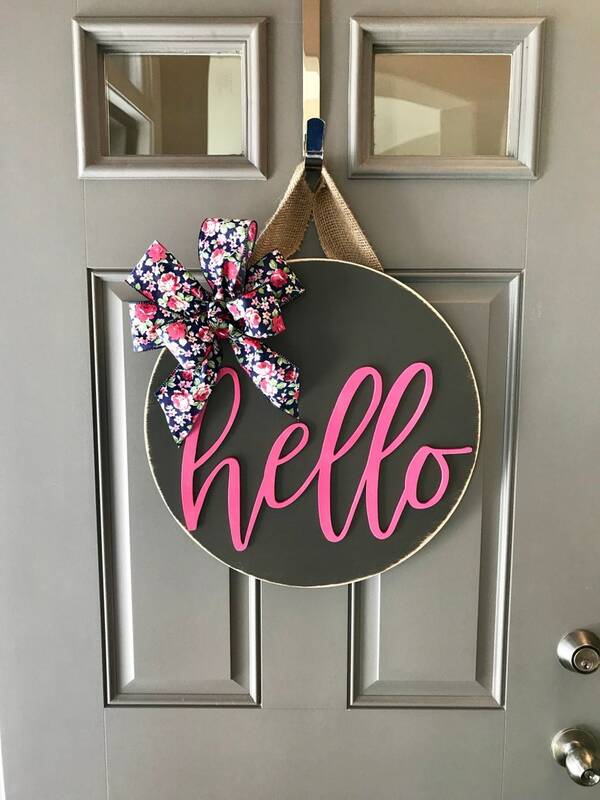 >>DESIGN: The wood round is dark gray and the 'hello' is pink. 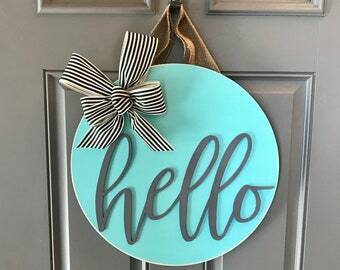 The bow is navy with a floral print. 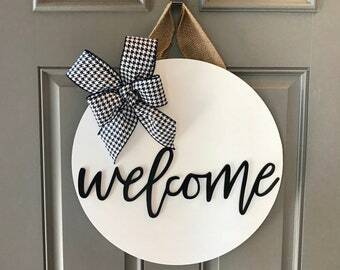 >>BOW: 99% of the time, the bow you see in the picture is what you will receive. 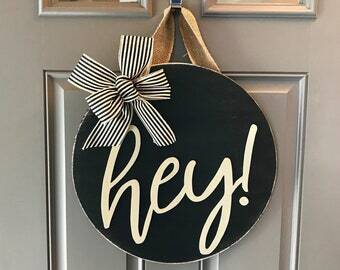 If a ribbon style is unexpectedly out of stock or discontinued, we will make an alternate selection that is close to the ribbon seen in the photos of this listing. Prior to shipping, we will contact you with this information. 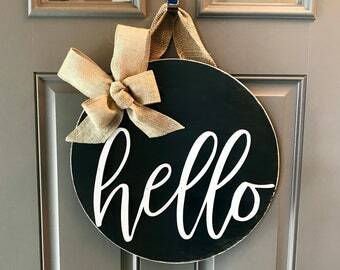 >>REAL WOOD: All door hangers are made from real wood (not MDF). Overall, the wood will have a clean, uniform look. Since this is real wood, there may be natural blemishes, visible wood grain and knots. All of this is part of the intended look and unique variation of the end product. Certain colors may show some of this natural look more than others. 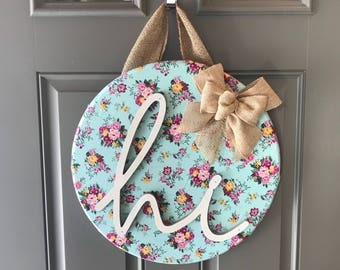 >>MADE TO ORDER: Each door hanger is handmade and constructed at the time an order is placed. Because of this, there may be very minor differences in the finished piece and what is seen in the photos of this listing. 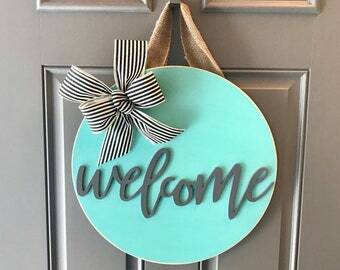 >>COLORS: If you are looking for different colors or ribbon than what you see in the photos, send us a message and we can usually accommodate. >>WHY US? With the millions of creative minds on Etsy, it's become challenging to offer a truly unique handmade piece. Ideas come and go, copycats come and go. We have 2 goals: produce high-quality unique products and provide great customer service. When you see the designs in our shop, please know that we tried to do something to make it our own. We do our very best to make a product that you will enjoy and feel you got your money's worth! We're also available to quickly respond to general questions and custom inquires. Thanks for taking the time to check us out! 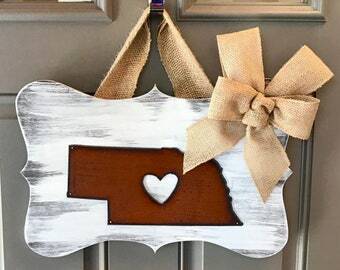 We hope you enjoy your new home decor. 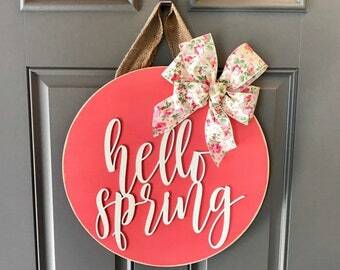 Perfect addition to my door! Thank you! 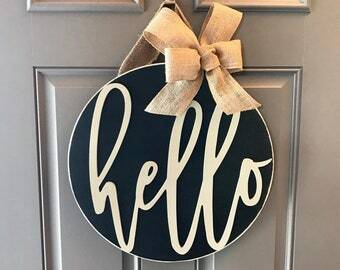 I am obsessed with my new door hanger! 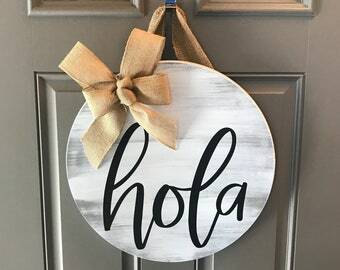 I have been looking for awhile for something to hang and it's perfect! I get so excited coming in and out of the door seeing it. ***If you have an issue with your order, please contact us with any questions or concerns prior to leaving feedback. We would like to have the opportunity to help resolve an issue. RETURNS/REFUNDS: You may request a return within 3 days of receiving your order. We must receive the item back to us within 21 days from the date you received your order. Buyer is responsible for return shipping charges. Item must arrive back to us in its original condition for a refund to be processed. You will be refunded the purchase price minus original shipping costs. We are unable to accept returns for custom or personalized items. DAMAGED IN TRANSIT: Send us a picture of the damage within 48 hours of receiving your order. A replacement will be sent after we also receive a picture of the item showing that it has been destroyed and cannot be used. ADDITIONAL RETURN INFO: Our products are coated with high quality stain and/or paint. When possible, we also apply a protective sealer (certain materials do not allow a sealer to be applied). Because many of our items are prone to UV exposure, we are unable to allow returns or provide refunds due to fading or discoloration over any period of time. Because our products are handmade and constructed at the time an order is placed, please allow UP TO 3 WEEKS BEFORE YOUR ORDER SHIPS. Available shipping methods are displayed at checkout. Most orders can ship via USPS Priority Mail. Once your order ships it will typically arrive in 2-3 days. If Priority Mail is not available for your order, it will ship via UPSP Parcel Select Ground, which can take up to 10 business days to arrive. ***REGARDLESS OF SHIPPING METHOD it will still require up to 3 weeks before your order ships. If you live in or near Elkhorn, NE you can use our local pickup option to avoid shipping costs. Enter coupon code LOCALPICKUP at the checkout. We will follow up once your order is ready to be picked up. Unless prior permission is given, this coupon code is ONLY good for orders that can be picked up from our location.